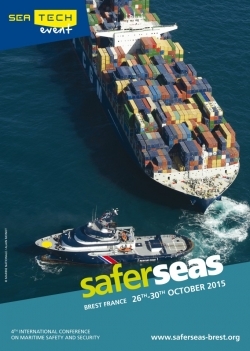 Safer Seas 2015 comes ashore in Brest, 26-30 October : Save your date! The 4th edition of Safer Seas, international event on maritime safety and security, will take place in October, 26th - 30th, in Brest. Join us there! For the 4th time since 2002, the international maritime community meets in Brest, at "Le Quartz" congress centre, to share their thoughts and works on issues of maritime safety and security, be it in a conference room, in the trade show alleys or around a coffee. As usual, there will be talks of save and rescue, of pollutions, of container carriers, of regulations, policies and technologies, however, attendees will also hear of markets, of industry and, perhaps more unexpected, of climate change. 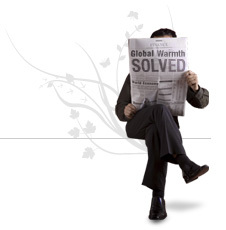 Maritime safety, climate, blue growth. Safer Seas traditionally considers the stakes of maritime safety together with the related economic obstacles or opportunities but these days, environmental issues and the possible answers to the climate and energy challenges are redefining the scope of maritime security and safety policies. From potential new maritime routes opened by the ice melting, to new regulations and technological innovations for greener, low-carbon ships; from the increase in offshore activities related to the exploitation of fossil or biomarine resources, to the rise of marine energies; there is no shortage of examples demonstrating that maritime shipping and the rules regulating it are no longer the alpha and omega of maritime safety and security. Consequently, "Blue Growth" was the theme chosen for this 2015 edition of Safer Seas to highlight the stakes of maritime safety and security and the world of possibilities that the seas have to offer. Safer Seas will be one of the last major milestones before the UNFCCC Conference of Parties, due to take place in December in Paris: oceans, climate, maritime safety, it all makes senses considering the numerous interactions between them... Indeed, it was not by sheer luck that the European Academy of Sciences symposium EURASC and its internationally recognized authorities chose Safer Seas to host their event.